A drainage catheter placed through a retrograde approach, usually cystoscopy, is the preferred method to provide renal drainage in all patients, because it avoids the complications inherent in a PCN. The percutaneous route should ideally be reserved for patients in whom retrograde attempts are either unsuccessful or not feasible (11). Preprocedural evaluation in patients being considered for PCN includes assessing the risk for bleeding and procedure-related infection. The surgical and medical literature does not support routine laboratory coagulation screening in all patients (12-14), but radiologists vary in their practices. Some advise routine testing of all patients undergoing invasive procedures (15), whereas others believe that it is sufficient to carefully question the patient for bleeding history, known liver disease, renal failure, use of antiplatelet drugs, and anticoagulant use to identify those with a potential increased risk for bleeding complications (16). Postponing an emergent PCN to wait for laboratory results is generally not believed to be necessary (17). Figure 1 A 24-year-old man with renal insufficiency due to bilateral ureteral obstruction by a large pelvic mass. (A) Axial T2-weighted MRI image through the kidneys demonstrates hydro-nephrosis of the right collecting system. The left kidney is atrophic. Other images demonstrated a dilated left ureter, indicating that the left renal atrophy was likely due to hydronephrotic atrophy from obstruction. (B) Axial T2-weighted MRI image through the pelvis demonstrates a large pelvic sarcoma. Other images (not shown) demonstrated marked compression of the urinary bladder. The ureteral orifices could not be identified at cystoscopy. (C) Contrast injection through a needle placed for PCN demonstrates right hydronephrosis. The procedure was performed with ultrasound guidance (not shown). (D) A self-retaining loop nephrostomy catheter was placed to drain the right kidney. Because the patient's disease was unresectable, only a unilateral right nephrostomy was performed. 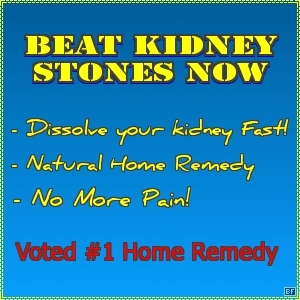 There was subsequent improvement in renal function. Abbreviations: MRI, magnetic resonance imaging; PCN, percutaneous nephrostomy. vitamin K1 or FFP administration (13). Most interventionalists do not postpone invasive procedures in patients who have taken aspirin or other drugs known to interfere with platelet function, such as nonsteroidal anti-inflammatory drugs and the newer betalactam antibiotics (13). Platelet transfusion will correct drug-induced prolongation of the bleeding time, if needed. Farrell and Hicks reported that a platelet count less than 100,000/dL (6) was a significant risk factor for bleeding and was associated with a higher transfusion rate after PCN. However a platelet count greater than 50,000/dL is believed to be a safe value for most patients (13). Septicemia is less common with genitourinary interventions than with biliary procedures, but the risk of periprocedural sepsis is increased in the elderly, in diabetics, in patients with indwelling catheters, stones, or ureterointestinal anastomosis, or in the clinical presence of infection (18,19). The organisms that commonly infect the genitourinary tract are gram-negative rods, such as Escherichia coli, Proteus, Klebsiella, and enterococcus. Antibiotic prophylaxis should ideally be based on culture results, but broad-spectrum antibiotics active against the common urinary pathogens, such as aminoglycosidae (e.g., gentamycin) in conjunction with ampicil-lin or cefazolin, or ceftriaxone (20), can be used in the absence of culture results. Antibiotics are best administered immediately prior to or less than two hours before the procedure (20). If given more than three hours prior to the procedure, the incidence of adverse infectious events increases fivefold (21). Antibiotic administration should be continued till satisfactory renal drainage is assured (20,22,23). Cochran et al. (22) reported that prophylactic antibiotics were beneficial in decreasing the development of sepsis in patients at high or low risk for developing sepsis. PCNs are often performed as an inpatient procedure. When performed on an outpatient basis, 12% to 25% of patients may require admission to the hospital after the procedure because of such complications as bleeding or sepsis (16). Patients who may not be suitable candidates for outpatient PCN include those with hypertension, untreated urinary tract infection, coagulopathy, and staghorn calculi (16,22). Standard measures, such as continuous electrocardiogram monitoring during the procedure, and large-bore and secure intravenous access are routinely used. Intravenous sedation combined with local anesthesia is sufficient to keep most patients comfortable. Use of transcutaneous oximetry is also recommended. The patients are positioned in either a prone or a prone-oblique position with the ipsilateral side elevated 20° to 30°; however, if the patient cannot lie prone, the procedure can be performed with the patient in a supine-oblique position. CT guidance is particularly helpful in the latter situation, allowing the completion of the procedure in 81% of patients in one series where a hybrid CT-fluoroscopy unit was used (24). In this study (24), the initial puncture was performed with CT guidance and the subsequent manipulations for catheter placement were performed using fluoroscopic guidance. Preprocedural CT or magnetic resonance (MR) scanning is highly recommended in patients with an aberrant anatomy (e.g., severe scoliosis or congenital renal abnormalities such as a horseshoe kidney) so that the relationship of the kidney to the liver, spleen, colon, gallbladder, and pleural space can be determined. In most patients, the collecting system is localized using either fluoroscopy or ultrasound (US) guidance. When the collecting system is moderately or severely dilated, US guidance is successful in aiding entry into the collecting system in 85% to 95% of patients. Conversely, in only mildly dilated collecting systems, the success rate may be as low as 50% (25). Regardless of the degree of renal collecting system dilatation, if renal function is poor (the usual case with obstruction) or if contrast cannot be administered, US guidance, preferably real-time, is the preferred way to localize the collecting system. Once the collecting system has been punctured, the remainder of the procedure is usually performed using fluoroscopic guidance alone, although there are reports of using sonography alone for the entire procedure (26). Fluoroscopic guidance can be used to enter the collecting system if a prior uro-graphic study is available for guidance, if there is an opaque calyceal calculus that can serve as the target for puncture (Fig. 2B,D), or if the collecting system can be opacified with contrast (either by excretion after intravenous administration or by means of a retrograde catheter) (Fig. 3A,B). Blind punctures of the kidney using anatomic landmarks, such as the "lumbar notch'' (27,28), are apt to require multiple punctures for optimal entry in as many as 40% of cases, and should be measures of last resort in modern radiology departments where the availability of ultrasound can facilitate appropriate and safe puncture of the collecting system with the fewest number of attempts. Numerous techniques have been described for PCN placement (6,15,16,27,29,30), all of which entail imaging and puncturing the collecting system, dilating the tract, and then placing a catheter. Planning the puncture site is a crucial step in the procedure. The skin puncture site is chosen so that the catheter enters the flank in the posterior axillary line and courses subcostally below the inferior margin of the 12th rib. This is done to minimize the chance of injury to the intercostal artery located on the inferior margin of the rib and also to decrease the chance of intercostal nerve irritation, which can be very painful. If the intercostal space between the 11th and 12th ribs must be used for the procedure, care should be taken to stay close to the superior aspect of the 12th rib to avoid the neurovascular bundle. The puncture and, therefore, the nephrostomy tract should traverse the renal parenchyma before entering the collecting system so that the parenchyma can provide a secure seal around the catheter. Entry into the collecting system should ideally be into a posteriorly directed calyx through the relatively avascular posterolateral plane of the kidney, the so-called avascular plane/line of Brodel. This is the zone where the renal artery divides into its major ventral and dorsal branches and lies at the junction of the anterior two-thirds and posterior one-third of the kidney, just posterior to the lateral convex border of the kidney. The posterior calyces point to this plane and can be identified as the more medially positioned calyces. Entry into the posterior calyces minimizes the risk of entering the large vessels in the renal hilum. If PCN is being performed for drainage alone, virtually any posterior calyx can be suitable for access, although an interpolar or lower polar posterior calyx is usually chosen. However, if PCN is to be followed by ureteral stent insertion, an interpolar calyceal entry is preferable so that the vector of pushing forces can be directed toward the ureteropelvic junction. Access through the upper pole calyces may be required in patients with stones, in which case an intercostal tract may be needed. Once the puncture site is chosen, local anesthesia is liberally administered into the skin site and throughout the proposed track to the level of the renal fascia. puncture is performed into the desired calyx; the first needle is not removed, to avoid decompression of the collecting system through the needle site and to provide a route for continuing opacification of the collecting system (Fig. 4). In patients undergoing nephrostomy for subsequent stone removal, initial puncture with 18-gauge needles is preferable because they are less flexible and thus easier to direct into the desired calyx than smaller gauge needles. Puncture of the renal infundibula or pelvis should be avoided because there is a high risk of injury to the interlobar vessels and the major segmental branches of the renal artery and vein. Sampaio et al. found that punctures through the calyceal fornix were highly unlikely to cause renal arterial injury, whereas infundibular punctures lacerated interlobar or segmental arteries in 23% of cases and direct renal pelvic punctures caused injury to a large retropelvic vessel in 33% of cases (Fig. 4C) (31). After advancing a guidewire through the needle, the nephrostomy track is dilated with fascial dilators to one size larger than the intended nephrostomy catheter, and the nephrostomy catheter is then placed. A self-retaining catheter is preferable, and these may be of a pigtail, accordion, Malecot, or Foley type. A ''self-retaining'' loop-type catheter (Cope loop catheter) in used in most cases because it is less prone to being inadvertently withdrawn than are the Malecot and Foley catheters (Fig. 1D). The only absolute contraindication to PCN is the presence of an uncorrectable bleeding disorder; however, if the bleeding diathesis is due to a coagulopathy caused by urosepsis, urinary drainage will be necessary before the bleeding abnormality can be corrected. If there are severe electrolyte changes because of the obstructive uropathy (e.g., hyperkalemia with serum potassium levels above 7mEq/L), emergency hemodialysis and/or ion exchange therapy should be considered before PCN to quickly correct the electrolyte abnormalities, because the cardioplegia associated with hyperkalemia can be refractory to all therapy. PCN catheter placement is successful in 98% to 99% of patients with obstructed dilated kidneys (6,17,30,32). Success rates are lower, in the range of 91% to 92%, when sonography alone is used for the procedure (26,33). In nondilated systems or in complex stone cases, 85% to 90% success rates have been reported (34,35). Figure 2 (Figure on facing page) Bilateral renal calculi in a 65-year-old man. (A) Plain radiograph of the abdomen demonstrates bilateral renal calculi, with partial staghorn configuration on the left. (B) Fluoroscopic guidance was used to target the right lower pole stone-bearing calyx for puncture. Note the second stone adjacent to the spine, which was located in the proximal ureter. A pigtail catheter medial to the kidney is in the biliary system in this patient who has had a liver transplant. (C) Contrast injection demonstrates that the proximal ureteral stone is causing obstruction. The lower pole stone is seen as a filling defect in the opacified collecting system. (D) Fluoroscopic guidance was also used to puncture the lower pole stone-bearing calyx of the left kidney. (E) Nephrostogram demonstrates the left staghorn calculus as a filling defect in the opacified renal pelvis and the lower pole calyces and infundibula. Figure 3 A 58-year-old woman who failed SWL for a left renal calculus. (A) Plain film demonstrates very faintly opaque calculus fragments coating the lower pole calyces and infundibulae. The patient had previously undergone SWL for a large left renal calculus (not shown). Note the retrograde catheter, which was placed so that contrast could be injected to facilitate the PCN placement. (B) Prone retrograde pyelogram shows innumerable stone fragments throughout the left pyelocalyceal system (patient is prone). PCN was performed through a lower pole calyx, and all fragments were successfully removed. Abbreviations: PCN, percutaneous nephrostomy; SWL, shock wave lithotripsy. 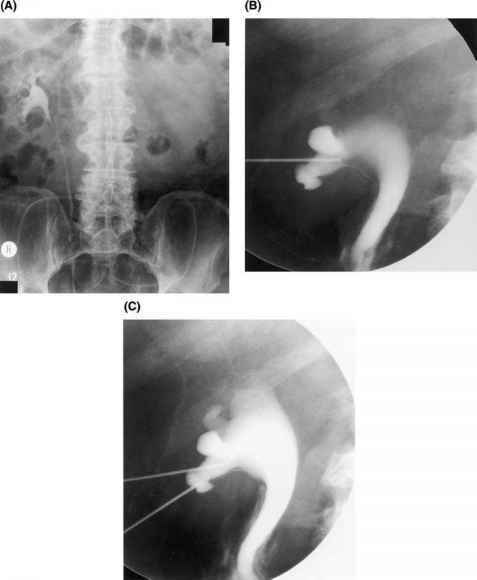 Figure 4 A 65-year-old man who had ureteroscopic removal of a distal left ureteral calculus. (A) IVU one month following ureteroscopy shows no excretion from left kidney due to highgrade obstruction. The patient was asymptomatic, and the IVU was a routine follow-up study after ureteroscopy. (B) Using ultrasound guidance, the collecting system was punctured. Contrast injection opacifies the hydronephrotic left collecting system (patient is prone). Note that the needle enters the collecting system in the lower pole infundibulum, a site that is unsuitable for catheter placement. (C) Fluoroscopic guidance was used to enter a lower pole calyx. Note that the initial needle is left in place to inject contrast and prevent decompression of the collecting system. The drainage catheter was placed through the lower pole entry site. Abbreviation: IVU, intravenous urogram. catheters on an emergent basis, mean procedure and fluoroscopy times were significantly longer for the more inexperienced radiologists (fluoroscopy and procedure times of 2 and 25 minutes for experienced operators and 10 and 42 minutes for inexperienced operators). Further, 20% to 33% of the procedures performed by inexperienced operators were repeated the next day because of catheter dislodgment or malposition, and emergency PCNs by less experienced radiologists resulted in higher rates of postprocedure sepsis and transfusions. Also, Lewis and Patel (36) found that proportionately more complications occurred when the procedures were performed after working hours rather than during regular working hours (5.7% vs. 1.8%). Because many patients who have nephrostomies after working hours may be sicker and have more complicated medical conditions than do those patients undergoing elective procedures, it is essential that appropriate staff and equipment be available at all hours to provide a consistently high level of care at all times (15,37). When obstruction is complicated by urosepsis or azotemia, the response to renal decompression is often immediate, with fever and flank pain improving in 24 to 48 hours after PCN drainage (38). 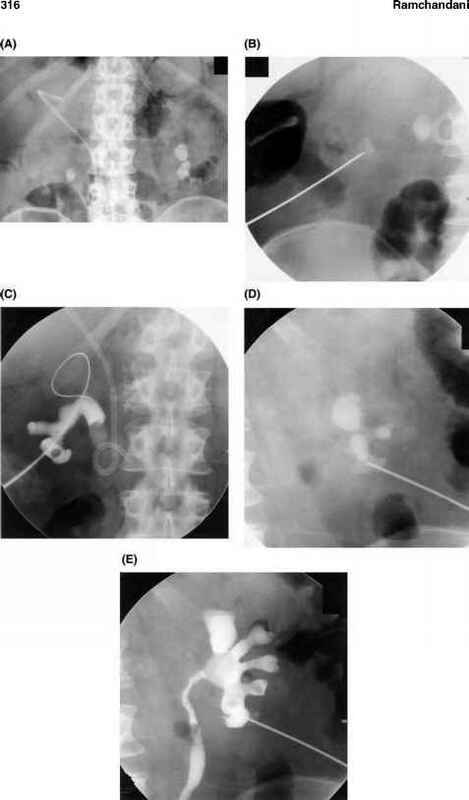 When obstruction and infection are due to uret-eral calculi, retrograde ureteral catheterization and PCN are equally effective in relieving the obstruction and infection, with neither technique superior to the other in promoting rapid drainage or clinical defervescence (39). However, percutaneous manipulations themselves can precipitate septicemia (manifested as shaking chills and fever) in these patients. For this reason, it is important that these patients be treated with intravenous antibiotics before the attempted PCN. In addition, forceful opacification of the collecting system to visualize the site and cause of obstruction should be deferred until the collecting system has been adequately decompressed for 24 to 48 hours and the patient is afebrile. In patients with fungal urinary infections, topical antibiotics can be directly infused into the kidneys if systemic toxicity prevents achieving effective therapeutic levels by parenteral administration. Obstructing fungus balls can also be extracted through the nephrostomy tract (40). In patients with azotemia secondary to obstruction, PCN can rapidly return renal function to normal or near normal levels. In one series (41) renal function normalized in 66% of patients in 15 days, and improved enough to obviate dialysis in 28%. 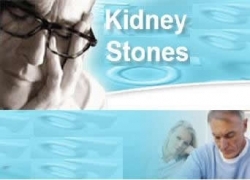 The mean number of days needed for normalization of renal function was 7.7 ± 4.1 days. Patients with benign causes of obstruction or gynecologic malignancies showed the best improvement, whereas older patients and those with prostate cancer showed the least improvement in their renal function. PCN can also be a temporizing measure to improve or at least preserve renal function while other therapies, such as radiation or chemotherapy, are given time to reverse malignant causes of obstruction. PCN drainage may also be required to optimize renal function before definitive surgery or to allow the administration of nephrotoxic drugs such as cisplatin. In patients with malignancies, the ureters can be obstructed by contiguous involvement or direct extrinsic compression. The need for external nephrostomy drainage is often permanent in such patients because ureteral stents often fail in adequately draining patients with extrinsic obstruction (42,43). Even with careful patient selection, 32% of patients are unable to achieve any improvement in the quality of life after PCN (44). Long-term survival after palliative diversion for malignant uret-eral obstruction is poor. In one series (45), only 25% of patients were alive at one year, and in another series (46), patients with ureteral obstruction secondary to bladder cancer had a mean survival of only 4.9 months (1-14 months). If a PCN is performed in these circumstances, only unilateral drainage is usually required. Bilateral nephrostomy usually confers no added benefit (41). In patients with bilateral obstruction due to malignancies, a reasonable approach is to drain the symptomatic side, if there is one, or to drain the kidney that appears to have more preserved renal parenchyma, as gauged by cross-sectional imaging (Fig. 1) (15). The contralateral kidney is then drained only if there is suspected infection or if unilateral drainage does not improve renal function enough to allow for administration of any necessary chemotherapy. The Standards of Practice Document by the Society of Cardiovascular and Interven-tional Radiology and an American College of Radiology (ACR) practice guideline for the performance of PCN provide guidelines and thresholds for complications associated with PCN (47,48). The overall serious complication rate of PCN is low, with a mortality of 0.2% compared to a surgical mortality of 6.0% (6). Complications related to PCN (6,30,32,47,48) can be divided into major, procedure-related complications (4% to 6% incidence) and minor complications (10% to 28% incidence). Major complications include hemorrhage and sepsis. Major Complication: Hemorrhage. Hemorrhage requiring transfusion or other therapy occurs in 1.0% to 2.4% of patients (6,32,49) and is usually related to renal arterial pseudoaneurysms or arteriovenous fistulas due to laceration of lobar arteries. Using small-needle access systems (21- or 22-gauge needle) may be no safer than 18-gauge needle systems (50). However, avoiding puncture of the anteromedial renal vessels by accessing the kidney through its relatively avascular posterolateral aspect (Brodel's line) may decrease the incidence of this complication (27,51). Most hemorrhages associated with nephrostomy placement are transient and self-limited. 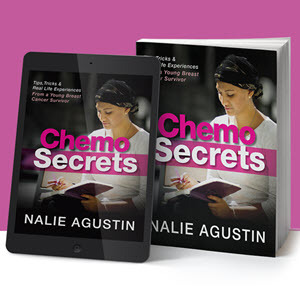 It is not uncommon to have pink or slightly bloody urine drainage for several days after a nephrostomy, and this is not considered a complication. Serious vascular trauma is suspected if the urine continues to be grossly bloody after three to five days, if new intrapelvic clots are observed on nephrostograms, or if there is a significant drop in the hematocrit. If the drop in the hematocrit is out of proportion to the urine blood loss, a retroperitoneal hematoma should be suspected and a CT scan obtained. Unsuspected retroperitoneal hematomas not requiring treatment have been reported in 13% of patients on CT scans performed after nephrostomy tube placement (52). Angiography and possible arterial embolization should be considered in patients who have significant continuous or recurrent bleeding for longer than four to five days after PCN placement (49). Major Complication: Sepsis. The incidence of sepsis after nephrostomy tube placement has been reported to be 1.4% to 21.0% (6,15,22,38). This wide variation is likely due to the differing definitions of sepsis in different series. Farrell and Hicks (6) reported that 1.3% of their patients required observation in the intensive care unit for sepsis or hypotension. The use of antibiotic-bonded nephrostomy catheters appears to have no influence on the overall incidence of infective complications associated with nephrostomy drainage (53). Air embolism has been reported in patients in whom air was injected through a retrograde catheter (pneumopyelogram) to visualize the collecting system (54). Using CO2 rather than air as a negative contrast in the collecting system can avoid this complication. emergent procedures (17) and only one pneumothorax seen in Farrell and Hicks' series of 454 patients (6). Puncture of the gastrointestinal tract is a rare complication. The colon may lie posterior or posterolateral to the kidney and can be entered during a PCN (55,56). Retrorenal position of the colon is more common in patients who are thin and have little retrorenal fat, who have colonic dilation, or who have an abnormal anatomy, such as marked kyphosis or scoliosis (55). The colon was posterior to the medial 2/3 of the kidney in 4.7% of prone patients at the level of the lower poles and posterior to the lateral 1/3 of the kidney in 10% of patients in one report (57). When there is doubt about safe access, preprocedure CT to delineate the anatomy is prudent. 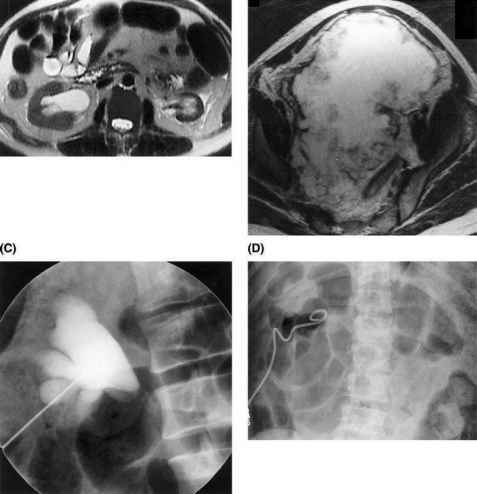 A transcolonic nephrostomy tract was seen in 2 out of 1000 cases of PCNL in one series (55). The complication can often be managed conservatively, with drainage of both the kidney and the colon by separate catheters till the created nephro-colic fistula heals (55,56). Duodenal injury is a rare complication (58). Inadvertent puncture of the spleen can cause severe hemorrhage or even a splenic abscess in patients, with infected urine (59). Other Major Complications: Thoracic Injuries. An intercostal approach (often required for access to the upper poles of the kidneys) causes more thoracic complications than a subcostal puncture (60). In expiration, a posterior intercostal approach between the 11th and 12th ribs poses little risk of injury to the spleen and liver (57), but the lungs remain vulnerable to puncture in many patients. The right lung is in the path of the needle in 29% and the left lung in 14% of patients in expiration. During maximal inspiration, the lung would be in the needle path in most patients in whom an intercostal puncture is performed. Other thoracic complications include pleural effusion, pneumonia, atelectasis, hydrothorax, and pneumothorax. Minor Complications. Minor complications that may occur are catheter dis-lodgment and urine extravasation. Catheter dislodgement in the early postplacement period occurs in less than 1% of patients but increases to 11% to 30% in the following months (6,17). Dislodgement in the first week after placement often necessitates a new PCN insertion and the creation of a new tract. Nephrostomy tube placement is considered a low-radiation dose procedure (61), with peak skin doses usually less than 1 Gy; however, exposure can be higher in as many as 12% of cases (62,63). This is an important consideration in pregnant patients who present with obstruction and require percutaneous drainage. Most PCN drainage catheters are replaced every three to four months on an outpatient basis. An interval longer than three months is frequently associated with tube occlusion (15). Replacement of occluded nephrostomy tubes can pose a challenge as intraluminal encrustation may prevent passage of a guidewire (64). Furthermore, with Malecot catheters, tissue may occasionally grow through the wings of the catheter, making them resistant to removal (65). Because of this problem, Stewart et al. believe that if nephrostomy tube drainage is required for longer than a few weeks, Malecot-type winged catheters should not be used (65). Catheter flushing at home between tube changes, whether by visiting nurses or the patient, does little to favorably influence the incidence of tube encrustation in most patients. In patients with rapid tube encrustation, a high fluid intake is the best way to keep catheters open. The presence of a nephrostomy tube invariably causes bacteriuria, candiduria, or pyuria within nine weeks of initial nephrostomy tube drainage. Prophylactic antibiotics in patients with PCN tubes does not prevent bacteriuria and, instead, contributes to the emergence of organisms that are resistant to the antibiotics being administered (66). Antibiotic prophylaxis is unnecessary in routine catheter exchanges when the catheters have been draining adequately and, in fact, fails to prevent bacteremia (66,67). Cronan et al. (66,67) found that asymptomatic bacteremia occurred in 11% of routine tube changes and that preprocedural antibiotics were unsuccessful in preventing bacteremia. This has implications for patients at risk for endocarditis, in whom routine tube changes should be preceded by antibiotic therapy with the aim of eradicating bacteriuria. Antibiotics should be chosen for activity against the organisms isolated in the urine, and after bacteriuria has been eliminated, an antibiotic regimen recommended in the American Heart Association guidelines for genitourinary procedures should be administered in conjunction with an elective nephrostomy tube change. What is the seldon technique in pcn? 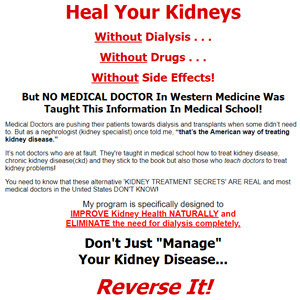 Why pcn is use to improve the function of Kidney?